Last weekend I rode the Big Horn 100 endurance ride with my horse Rocky. I love the ride. It was my tenth time around the circuit and my ninth completion under the time limit. My first time around was in 2003 and over the past fifteen years, I have ridden Frank, my orphaned BLM mustang Whiskey, and Rocky across the Big Horns. Rocky is seventeen years old and it was his fourth completion in four years. My horse Frank and I led the field from start to finish in 2003 winning the ride and receiving BC. The Big Horn is forever in my heart. The Big Horn 100 is one the premier 100-mile rides sanctioned by AERC. 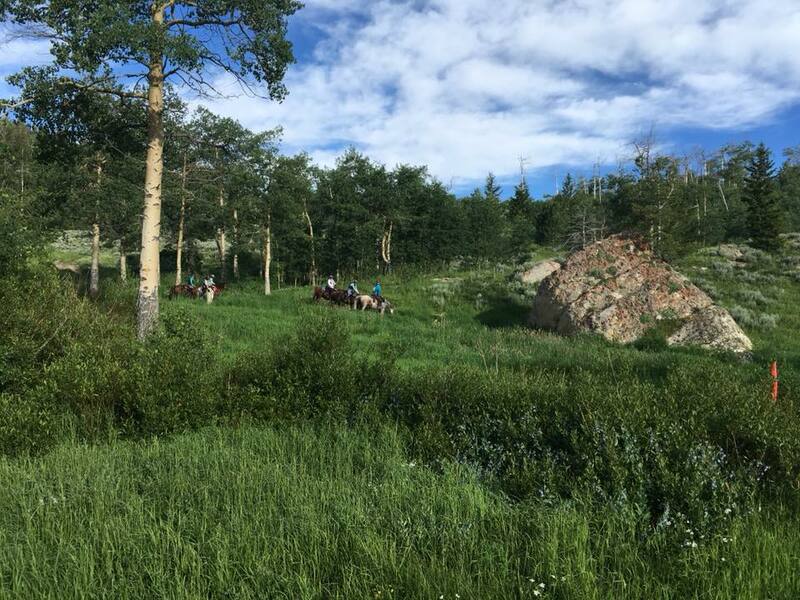 The ride pre-dates the AERC and legend has it that a young veterinarian named Dave Nicholson was key in setting the original trail through the Big Horn Mountains. The Big Horn 100 is a big-loop ride and very few big-loop or point-to-point endurance rides are offered. The Big Horn trail travels through spectacular mountain scenery, crosses rivers and streams, travels through steep canyons and old-growth forest. The elevations along the trail range from about 4,000 feet to 10,000 feet. I do not believe that any other 100-mile endurance ride climbs to 10,000 feet. Parts of the Big Horn trail are remote and wild. Big Horn is not an easy 100. Ride management changes the course nearly every year and the final course may not be known until the ride meeting on the evening before the ride. All of the present variations are much more difficult than the original course that was abandoned after 2005. Today’s route has greater elevation changes and is slightly longer than the original trail. I was crewing for Lynn on the Big Horn 50 on Friday so I missed the vet-in, dinner, and the ride meeting. Fortunately, my camp neighbors Tom and Traci, and the ride managers, completed my registration and took Rocky through the vetting. When I arrived back in camp, all the paperwork was finished for the start the next morning. Camp hosts Mel and Sharon cooked an elk burger for me – thank you all! As I saddled up, a shooting star streaked northward and I thought of Frank. We left ridecamp at 4:00 am under a canopy of stars and headed north across the shale badlands. There was no moon and it was very dark. As I rode alone, I thought of the Pony Express riders and their horses carrying the news of Lincoln’s election across the west. They rode their horses on darkened trails just like this. The early trail had been changed to a section that we had not ridden since 2005. On other years, I had looked back at this section and had wanted to experience it again. This year was my chance. There were several other riders from SW Idaho and we connected on the trail just before dawn. We were to ride together through day and night all the way to the finish – five women and me. At about fourteen miles, we passed through a trot-by. Lyle, the head vet, smiled as he watched our horses and Regina offered us water and feed. Regina was the crew chief for the ladies from Idaho. We were off to a good start. The climb up the Dugway is where the Big Horn really begins. I looked back over my shoulder to the Big Horn basin and beyond. I thought of Frank and Whiskey and how they carried me up the grade. I thought of other years on Rocky. I thought of friends who rode with me on the grade and all those memories blend together to be a part of me today. As we made the turn to the right at the top of the grade, I cast a few strands of Frank’s tail hair to the wind. Frank was a Big Horn horse in his heart and I still feel his spirit, especially on the Big Horn trail. We traveled through the canyons, up and down, across the dividing ridges, and through the mountain streams finally making our way to the Big Horn Plateau. The wildflowers were in full bloom and the honey-sweet scent of flox was everywhere in the air. Our group took up a quick trot across the plateau, laughing and telling stories as we opened and closed the gates along the trail. After 34 miles, we trotted into the first vet check at Horse Creek where Rocky quickly pulsed down. Lynn met me at the vet check and took superb care of Rocky. I wandered over to the cook table and gathered together an excellent breakfast of scrambled eggs and hash browns. For the rest of the hour, I sat in a chair, watching Rocky and enjoying my experience. We left the road on a climb leading to a ridgeline fence. The fence is one of the few places where you can still see the deeply weathered signs with only “100” carved into wood to mark the original trail. Looking across to Antelope Butte, I was thinking, “This is one of my favorite places on the trail.” I like the weather-beaten sign, the expansive views, and the complete lack of a trail through this section even though the route is clear. I have many photos of friends on this ridge. We rode down to the ski area and I quickly passed through knowing there was natural water and grass just up the trail. Unfortunately, Merri’s horse was slightly off so she dropped from our group. We then began the climb back to the plateau telling more stories and laughing. We shared personal stories and deepened our 100-mile friendship through our trail experience. This year, we diverted over to the Mail Trail. The Mail Trail was new and I was hoping that it offered an easier descent to Shell Creek. It was a smooth descent but as soon as the trail reached the creek it became rough and rocky and our pace slowed considerably. We crossed several log bridges that flexed and swayed for the horses. Very few riders know the feeling of riding a solid horse across a bridge as it bounces and sways. I truly enjoy the single-track sections of the Big Horn trail, but they can be very slow, and this trail was slow. We met our crews again where the road crosses Shell Creek and then we were off on the long climb to the vet check at Battle Creek. We took our time climbing because it had been a long day and we faced a long night. It was late when we came into the vet check at Battle Creek. We were tired and feeling the effects from riding all day. I was concerned about the time we lost on the Mail Trail and I was lost in my own world as I prepared for Boulder Basin. All day the question in our group of riders had been, “Will we be off the Shag Nasty before dark?” I felt confidence and doubt all at the same time and now we faced the test. I placed my headlamp on my helmet. We left Battle Creek at about 5:30. We had already ridden sixty miles but ahead of us were big climbs and descents, river crossings, and the highest point of the trail at 10,000 feet. Five hours on the trail would bring us back to Battle Creek in darkness. We rode off and we made steady progress catching Cindy Collins, Gunnar and Alana Frank and the posse increased to ten. The trail was scantly marked but I know the route. I began to feel the weariness and responsibility of leading friends on a 100-miles of trail when the trail marking is not clear. On the descent to Shell Reservoir, we briefly split up. I rode on and saw Tom Currier and Jennifer Kaplan at the Shell Reservoir outflow, but they were soon gone, setting a pace that was too fast for me. We rode on passing along the waters of Adelaide Lake and then on through Boulder Basin climbing the rocky trail. At the high point, the top of the Shag Nasty, there were no trail markings. I was frustrated knowing that the top is a very easy place to lose the trail. I had to take my time to be sure because others were relying on me. I rode on down knowing the way but also knowing that the trail was confusing. I looked back over my shoulder but no one was there. I left the trail and rode across to a meadow where I could see better and be seen myself. I saw Connie high on the ridge. I called to her and she collected her friends to rejoin the trail. We finally saw a flag well off the top confirming that we were on the trail. Soon we were together again making a fast pace down the Shag Nasty. The Shag Nasty has good footing and we used the trail to our advantage. We met Patti Tollman marking trail and soon met Regina when we rejoined the road. We were off the Shag Nasty before dark! We picked up a very fast trot. We maintained that fast trot all the way to our second Battle Creek hold which we reached just at 9:30. We ran the Boulder Basin loop in four hours, an excellent pace, but Tom and Jennifer were not there. Where did they miss the trail? Were they prepared to spend the night out? Were they in trouble? No one knew. We left Battle Creek in complete darkness. I was cold and I am always cold at Battle Creek after dark. Even on my tenth trip, I still had to convince myself that I would again feel the summer heat in less than a mile from Battle Creek. The trail led us through herds of horses and herds of cows, showing only their eyes and their dark shadows beside us on the trail. We saw a very new moon slowly reveal her crescent figure as she slipped between the clouds and the horizon. Lightning flashed in the distance and the whole feeling was surreal. I have said before, “The magic in a hundred doesn’t appear until the second fifty.” There was magic in the air. There is only one trail down off the mountain. Layne, Shyla, and I made our way down in the nighttime darkness. I used a headlamp and led down the trail. The descent off the mountain can seem never-ending. It is a tough section of trail made even tougher by all the previous miles. Our horses briefly became tangled in a mass of barbed wire and fencing debris near the stock ponds. Later, the mud bogs from the stock water overflow were deep and soft. Lameness became a real concern for us all. We came down and made the big turn trotting in to this year’s finish at Trapper Creek. Rocky and I crossed the line at 1:30 in the morning. He ran strongly through the 100 miles being forward from the start all the way to the finish. Rocky was a twenty-dollar Craigslist horse destined for the killers only a few years ago. Today, he has an enviable record and I am very proud of him and all that we have done together. Rocky is a good horse. We had an informal awards ceremony way too early the next morning at 7:00 am. Even so, I enjoyed talking with the few riders who were awake and about. There was no breakfast this year and I greatly missed sharing scrambled eggs and stories with the other riders and crews who have become true friends over the years. We all packed up and headed our own separate ways after brief good-byes. Looking back on my ride, the first sixty miles of the trail all the way to the Battle Creek vet check was very well marked. Even the new section down the Mail Trail was slow but easy to follow. After Battle Creek the trail markings became very sparse or non-existent. There were almost no markings on the loop around the lakes and through Boulder Basin. Many riders missed the turn at the highest point on the course and found their own trails to reconnect with the route before darkness. Many of us were showing deep frustration by the time we returned to Battle Creek. The trail beyond Battle Creek down the mountain to the finish was also sketchy. The wire and fence debris was dangerous. The markings were intermittent and provided more confirmation than direction. Perhaps it was trail sabotage, but I find sabotage doubtful due to the long distances and difficult access. The Big Horn 100 is truly one of the premier rides sanctioned by the AERC. In my opinion, it is time for the AERC to take a larger role supporting this premier ride and it is time to the ride management to embrace outside support. It is time to delegate and assign tasks because managing the Big Horn is too much for one person and even too much for one family. We can all do our part. I think if we start now, we may even get the wilderness trail back. Perhaps it is time for the Big Horn 100 to return to its roots and become the type of event that was the venue for high-profile rides such as the Race of Champions. I love the Big Horn 100. With the countdown at less than 10 days til T-Day, and less than a week until D-for-T (Departure-for-Tevis) Day, I figured I’d better get a move on and get this story out before too much time goes by. The Strawberry Field Forever ride has been on my bucket list since I started distance riding. Back in 2002, when I had been doing about half a season of NATRC, I went to Mimi’s and my last POA show…the POA Worlds, up in Spanish Fork, UT. It was an almost week-long gig, with only so much for someone who is not showing (aka, “one’s show parents”) to do…so my dad took a couple of days to go up to the Strawberry NATRC ride. Originally his plan was to hang out and visit, but he got drafted as ride photographer. Long story short, he fell in love with the area and the amazing scenery, and we talked for years about how we needed to get up there again and do the ride. So imagine my delight when I found out there was also an endurance ride up there. Ir’s been on my ride radar for forever, so I was quite ecstatic when Troy contacted me to see if I would be interested in riding Flash for a couple of days at Strawberry this year.